Sometimes, it seems nobody loves the euro. The European single currency has been heavily criticised since the start. Even before the Global Crisis, economists raised serious concerns about potential flaws in the EMU design (De Grauwe 2006). Yet it took a severe crisis to prompt European leaders to announce plans for reforming it into a “genuine” EMU (Begg 2014). The debate about the future of the EMU entails a careful examination of the costs and benefits of the single currency. A fundamental criterion for optimal currency areas is the degree of synchronisation of economic activity. Synchronisation is often measured as the correlation between two data series that capture economic activity in two countries or between one country and a group of countries (e.g. the Eurozone). In this column, we take stock of the empirical evidence on synchronisation of business cycles in Europe. We try to identify whether and by how much synchronisation changed across European countries after the introduction of the euro. We conclude that the available evidence suggests a significant increase in synchronisation, and we estimate that about half of this increase can be attributed to the euro. Some argue that the euro doesn’t work because it is a political project (Jespersen 2016). It may well be so. Yet it is also a project deeply immersed in the history of economic thought; the 1960s saw the advent of a theory on optimum currency areas (Mundell, 1961) as well as the first plans for a European single currency (the Werner Report). Although currency union plans were abandoned after the collapse of the Bretton Woods system in the early 1970s (Eichengreen 2007), they were revived in the late 1980s (e.g. the Delors Committee in 1989). This revised plan for a new European currency was accompanied by an intense debate on the endogeneity of optimal currency areas (Frankel and Rose 1998, Krugman 1993). For a so-called political project, the euro seem to possess a solid economics pedigree. Distinguishing criticism of the euro project and assessment of its effects also shows stark division over its implications. Critics of the euro project claim its achievements are illusory, and predict an eventual collapse of the European single currency (e.g. Feldstein 2013). Econometric evidence tells a somewhat different story. It suggests the euro has supported significant increases in international trade flows (Glick and Rose 2016, Glick 2017), foreign direct investment (De Souza and Lochard 2011), price convergence and competition (Cavallo et al. 2014), financial integration (Kalemli-Ozcan et al. 2010), and structural reforms (Alesina et al. 2011). Thus, while some predict the demise of the euro project, economic theory and econometric evidence point in different directions. How might we reconcile such disparate views? Is our interpretation of the econometric evidence biased or distorted by non-economic arguments? One way of reconciling these views is to stress the possibility that while politicians and media commentators are often pessimistic about the single currency, academic economists tend to view it as having generated substantial benefits. The latter also point out that one of the main drawbacks has been the euro’s inability to distribute these benefits across countries, chiefly between the core and the periphery (Giannone et al. 2011, Wyplosz 2016). In other words, the euro created substantial economic benefits (‘glass half full’), but failed to distribute them widely across member states (‘glass half empty’). The discussions about lack of convergence in Europe, the persistence of ‘imbalances’ and EMU deepening can also be understood as ways of enhancing those distributive mechanisms. In a recent paper, we report a systematic evaluation of the econometric evidence on the effects of the introduction of the euro on business cycle synchronisation in Europe using meta-regression analysis (Campos et al. 2017). Christensen and Miguel (forthcoming) discuss meta-regression analysis among other techniques used to systematically summarise findings of a body of evidence. Unlike conventional literature reviews, meta-analysis uses statistical methods, which makes it less susceptible to the reviewer’s biases, tastes, and preferences (Stanley and Doucouliagos 2012). We use a unique hand-collected database encompassing results, design and estimation characteristics of 2,979 estimates from 63 studies on business-cycle correlations between European (mostly EU) countries over the past six decades. These econometric studies use several variables for synchronisation (e.g. GDP, industrial production, and inflation), a variety of methods to calculate correlations (e.g. simple correlations of growth rates and correlation of de-trended variables), and multiple econometric methods (e.g. HP filter and structural VAR). Meta-regression analysis tries to generate a systematic summary of the evidence accounting for these differences. The grand average of the business cycle synchronisation correlation coefficients is 0.48. Our main finding is that there has been an increase in synchronisation that is statistically significant and seems to be largely due to the introduction of the single currency. 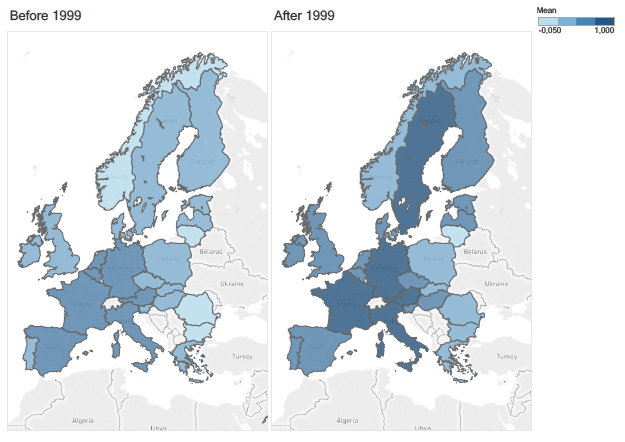 To assess how synchronisation changes over time (especially before and after the euro’s introduction in 1999), we use two methods. We consider all estimates and separate them into two groups according to the middle year of their estimation window – i.e. one where the middle year of the sample occurs before 1999, and the other after. The set consists of 2,010 pre-euro estimates and 969 euro-era estimates. However, the two groups overlap. We find that the value of the average business cycle synchronisation correlation coefficient increases from 0.43 before the euro to 0.60 afterwards. Figure 1 illustrates how these correlations change over time for individual countries. Darker shades indicate higher correlation. Source: Campos et al. (2017). These results are even stronger if we include only studies where the estimation window ends before 1999 or starts in or after 1999. This generates two non-overlapping sets of estimates, but we have ‘only’ 742 before-1999 estimates and 501 estimates for 1999 and after. In the non-overlapping case, the value of the average business cycle synchronisation correlation coefficient increases even more starkly from 0.38 before the euro to 0.73 after. We find that the increase in business cycle correlation coefficients is observed in all Eurozone and non-Eurozone countries in Europe, but it is heterogeneous. We also identify multiple factors that help to explain the variation in synchronisation estimates. For instance, using quarterly data or Blanchard-Quah decomposition systematically lowers synchronisation estimates. The increase we document in business cycle synchronisation in both the Eurozone and in non- Eurozone countries could be the result of monetary integration, spillovers of shocks from the Eurozone to other regions, or both. The past two decades have also seen globalization, further financial and economic integration and EU enlargements – all of which are likely to affect business cycles across Europe. To try to differentiate between genuine euro effects and the effects of other factors, we use a difference-in-difference approach (Donald and Lang 2007) in which the euro’s introduction is considered as the treatment, while the other European countries comprise the non-treatment group. These results show that the euro introduction has a statistically significant effect on increasing business cycle correlation. The magnitude of the effect seems to be between 0.10 and 0.15, which is at least half of the overall increase in business cycle correlation we document. This effect remains robust when we include country fixed effects and a whole range of other explanatory variables. However, they become insignificant when country-specific time trends are also added, suggesting the euro effects are country-specific, a finding similar to those for the euro’s effects on trade (Baldwin 2006). Obviously, country-specific trends can also pick up the increasing effect of the euro on business cycle correlation for countries that joined the euro so, at the end, it may be too conservative a robustness check. The main policy lesson from this exercise is that business cycle synchronisation in Europe has increased due to the introduction of the euro. This increase is statistically and economically significant. The heterogeneity of the effects is of particular interest as our results suggest that increases in synchronisation are substantially more pronounced in euro countries than outside the Eurozone and deserve further research. Alesina, A, S Ardagna and V Galasso (2011), “The euro and structural reforms,” in A Alesina and F Giavazzi (eds. ), Europe and the Euro, University of Chicago Press. Baldwin, R (2006), “The Euro’s Trade Effects,” Working Paper No 594, ECB. Begg, I (2014), “Genuine Economic and Monetary Union,” in S Durlauf and L Blume (eds. ), The New Palgrave Dictionary of Economics, Palgrave Macmillan. Campos, N, J Fidrmuc and I Korhonen (2017), “Business cycle synchronisation in a currency union: Taking stock of the evidence,” Bank of Finland Discussion Paper 28/2017. Cavallo, A, B Neiman and R Rigobon (2014), “Currency unions, product introductions, and the real exchange rate,” Quarterly Journal of Economics 129(2): 529-595. Christensen G and E Miguel (forthcoming), “Transparency, reproducibility, and the credibility of economics research,” Journal of Economic Literature. Donald, S and K Lang (2007), “Inference with difference-in-differences and other panel data,” Review of Economics and Statistics 89(2): 221-233. De Grauwe, P (2006), “What have we learnt about monetary integration since the Maastricht Treaty?” Journal of Common Market Studies 44(4): 711-730. De Sousa, J and J Lochard (2011), “Does the single currency affect foreign direct investment?” Scandinavian Journal of Economics 113(3): 553-578. Eichengreen, B (2007), The European economy since 1945. Princeton University Press. Feldstein, M (2013), “Coordination in the European Union,” NBER Working Paper No. 18672. Frankel, J and A Rose (1998), “The endogeneity of the optimum currency area criteria,” Economic Journal 108(449): 1009-1025. Giannone, D, M Lenza and L Reichlin (2011), “Business cycles in the euro area”, in A Alesina and F Giavazzi (eds. ), Europe and the Euro, University of Chicago Press. Glick, R (2017), “Currency unions and regional trade agreements: EMU and EU effects on trade,” Comparative Economic Studies 59 (2): 194-209. Glick, R and A K Rose (2016), “Currency unions and trade: A Post-EMU reassessment,” European Economic Review 87: 78-91. Jespersen, J (2016), The Euro: Why it Failed. Springer. Kalemli-Ozcan, S, E Papaioannou and J L Peydró (2010), “What lies beneath the euro's effect on financial integration? Currency risk, legal harmonization, or trade?” Journal of International Economics 81(1): 75-88. Krugman, P (1993) “Lessons of Massachusetts for EMU,” in F Giavazzi and F Torres (eds), Adjustment and Growth in the European Monetary Union. Cambridge University Press. Mundell, R (1961), “A theory of optimum currency areas,” American Economic Review 51(4): 657-665. Silva, J and S Tenreyro (2010), “Currency unions in prospect and retrospect,” Annual Review of Economics 2(1): 51-74. Stanley, T D and H Doucouliagos (2012), Meta-Regression Analysis in Economics and Business. Routledge. Wyplosz, C (2016), “The six flaws of the Eurozone,” Economic Policy 31(87): 559–606.